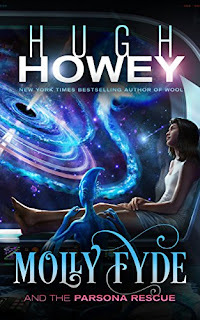 A book review - Molly Fyde, The Bern Series from Hugh Howey, starts out like any other story or series. We meet our primary cast of characters, we get caught up in their personal situations and follow Molly Fyde as she ends up on a quest to find her parents old ship, the Persona. (Molly Fyde and the Parsona Rescue) It felt like a well written piece, with the standard story of personal quest and challenges around every corner. The pace was quick and to the point, unless it wasn’t. But you never know it wasn’t to the point until you got past the moment and realized that what you just read lead up to THIS moment. It was like having a huge and entertaining puzzle unraveled for you, one page at a time. The first book was Molly’s adventure and her dedication to that adventure. But then the story evolves beyond her in book 2 of the Bern Series (Molly Fyde and the Land of Light). It evolves to include a much larger landscape of involved entities. Her personal pursuit becomes something more than to just her own cause. As you read along, events are set in motion that you don’t even realize will impact the story later on, but they do. And those moments when some of the puzzle pieces coming together later make you say, ah, out-loud. So everything you read, could very well be coming back as it relates to the story later. By book 3 (Molly Fyde and the Blood of Billions) you now realize exactly how her own personal search impacts others and why, in book 1, she was sent off to find her parents old ship. (Well, maybe you came to this realization in book 2 of the Bern Saga). Things are coming together and now, instead of just Molly or just a planet, you realize how far encompassing her quest has truly become in this Bern Saga. And WTH is a Bern??? Patience my dear reader. It becomes all too clear soon enough within the third book. If you’ve ever read a book series and the ending sucked, take heed, Hugh Howey wraps up this space-faring story in the proper fashion with a proper ending. An ending of epic proportions for Molly Fyde and her cast of associates. Book 4 (Molly Fyde and the Fight for Peace) [FOR ME] was both satisfying and frustrating. It was frustrating because close to half the book is back story for events from the other three books. If you love back story, you will love half this book. But there was so much of it that at times, when I came out of each of the back stories I was trying to grasp at where I was in the present story. Seriously, each back story almost deserved its own short story book. And I have to say that the look back at the past of a few characters brought much to light or probably answered a readers curiosity about some facets of several of the characters. Be it as it may, if you love story closure and resolution, you will love this book. Everything comes to a head and unlike stories of past, this story has loss, wins, frustration and satisfaction. All wrapped up with a... well, you’ll need to read the book to see how Hugh actually ends the book. I ain’t fessing to nuthin! When I said earlier that there are puzzle pieces in the story throughout, I meant it. It’s not as evident in the first two books, but in the third and fourth, there are “ah ha’s” in book 4 that point to book 1 and you see the moments from book 1 and how they formed a foundation for book 3 and so forth! Admittedly Hugh, I was on the bubble with book 1. Good read but it felt like just another sci fi book with a tease of potential. That potential was that there were three other books. That meant that everything in book 1 had meaning for this Bern Saga of yours. And yet, when you started to expound on the story and it evolved beyond Molly, beyond her relationships, beyond her species, and bey… (no more spoiler here), it became a gripping, pressure filled tale of anxiety for poor Molly, who all she wanted to do was find her dad’s ship. The ship she had so many great childhood memories of. In the end, with my eyes wide in anticipation for book 4 of the Bern Saga, you delivered. I enjoyed not trusting, hating, hoping to trust and not trusting one particular character, whose skills seemed invaluable at all the right and wrong times. I enjoyed wondering about relationships. I loved the worlds of floods, of beautiful fauna and of intense light. I enjoyed learning about the different worlds Molly visited and how their tales all came together in your writing. I loved that new hand-held weapon you came up with. Wow, that was nuts. Yea, but how do I really feel?